Definition at line 41 of file CChemEqElement.h. Definition at line 40 of file CChemEqElement.cpp. Definition at line 51 of file CChemEqElement.cpp. Definition at line 62 of file CChemEqElement.cpp. Add to the multiplicity of the element. Definition at line 92 of file CChemEqElement.cpp. Definition at line 70 of file CChemEqElement.cpp. Retrieves the metabolite of the element. Definition at line 86 of file CChemEqElement.cpp. References CKeyFactory::get(), CCopasiRootContainer::getKeyFactory(), and mMetaboliteKey. Referenced by SBMLImporter::applyStoichiometricExpressions(), CSBMLExporter::createReaction(), CModelExpansion::duplicateReaction(), CODEExporterC::KineticFunction2ODEmember(), CModelMerging::mergeMetabolites(), and CModelExpansion::replaceInReaction(). Definition at line 83 of file CChemEqElement.cpp. Referenced by CChemEq::addElement(), CModelAdd::addReactions(), SBMLImporter::applyStoichiometricExpressions(), CODEExporter::exportKineticFunction(), and SBMLImporter::isMassActionExpression(). Retrieves the multiplicity of the element. Definition at line 95 of file CChemEqElement.cpp. Referenced by CChemEq::addElement(), CModelAdd::addReactions(), SBMLImporter::applyStoichiometricExpressions(), CSBMLExporter::createReaction(), CModelExpansion::duplicateReaction(), CODEExporter::exportKineticFunction(), SBMLImporter::isMassActionExpression(), and CODEExporterC::KineticFunction2ODEmember(). Definition at line 64 of file CChemEqElement.cpp. 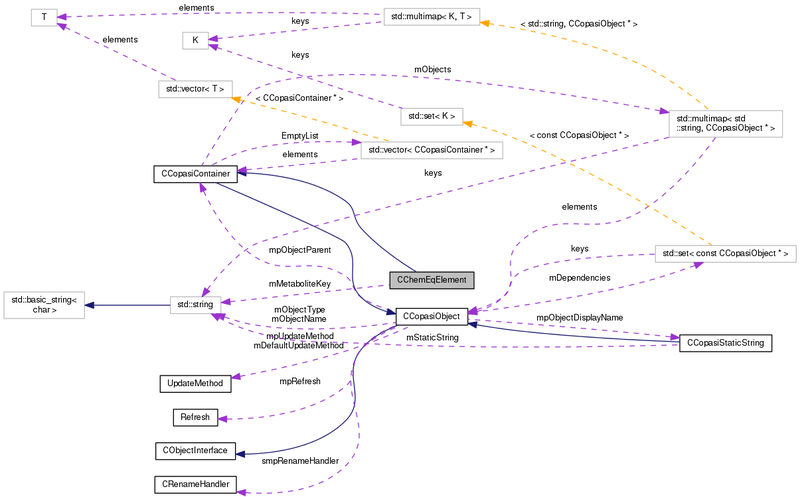 References CCopasiContainer::addObjectReference(), mMetaboliteKey, mMultiplicity, and CCopasiObject::ValueDbl. Set the metabolite of the element. Definition at line 72 of file CChemEqElement.cpp. References CKeyFactory::get(), CCopasiRootContainer::getKeyFactory(), CCopasiObject::getObjectName(), mMetaboliteKey, and CCopasiObject::setObjectName(). Referenced by CChemEq::addMetabolite(), CModelMerging::mergeMetabolites(), and CModelExpansion::replaceInReaction(). Set the multiplicity of the element. Definition at line 89 of file CChemEqElement.cpp. Referenced by CChemEq::addElement(), CChemEq::addMetabolite(), and CChemEq::setMultiplicity(). Definition at line 100 of file CChemEqElement.cpp. Definition at line 49 of file CChemEqElement.h. Referenced by getMetabolite(), getMetaboliteKey(), initObjects(), operator<<(), and setMetabolite(). Definition at line 54 of file CChemEqElement.h. Referenced by addToMultiplicity(), getMultiplicity(), initObjects(), operator<<(), and setMultiplicity().